Demonstrators continue to take to the streets across Iran to protest its oppressive regime. Economic issues have powered many of the recent demonstrations, as citizens of all walks of life protest the corruption of the ruling regime. The regime has attempted to quell the protests with mass arrests and suppressive forces rather than address the concerns of the Iranian people. On April 15th, the Khorasgan people in Isfahan saw their houses attacked in the dead of night by suppressive forces hoping to prevent the protests from spreading. Farmers and youths in the city were arrested as part of this suppressive action. Repressive forces maintained a presence of fear and intimidation in the city in a failed attempt to prevent further demonstrations. 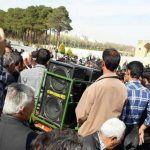 Anti-riot mercenaries traveling in twenty cars and four buses were dispatched to the city to stop the protests by the people of Varzaneh, MEK network inside Iran reported. Demonstrators are raising their voices to protest a number of issues. In Khuzestan province, villagers from Jofair in Hoveizeh protested for the right to use water from Jofair Project. In Ahvaz and Shushtar, protesters demanded the return of their looted deposits from the Arman Vahdat governmental institution. 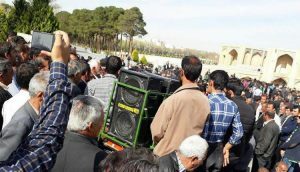 In Mashhad, a rally was held by the people looted by Caspian institute outside the Pamchal branch in Sajjad Boulevard. In Tehran, Tarbiat Modarres University students protested corruption at their school, including looting the University’s budget, the illegal evacuation of dormitories, and renting university facilities, such as gyms and swimming pools, for profit. In Yazd, health center workers protested months of having their salaries unpaid. They also protested their lack of job security. In Yasuj, families of the victims of the fatal Asman airlines crash last year met at the Red Crescent building to protest the ruling government’s failure to recover the bodies of crash victims. They called on Tehran to find and return their families’ bodies. In Tabriz, fans of the Tractor-Sazi team protested the team’s executive manager, Ajorlu, and suppressive acts against the team and its fans. In several cities, including Qazvin, Kerman and Yazd, educational services purchase plan teachers demonstrated in front of Ministry of Education offices for the second time, asking for payment of their salaries and full insurance. They also demanded to be paid the same as official employees. Protesters employed a variety of strategies to express their anger at the ruling regime. Protesters in Ahvaz blocked the doors of Arman Vahdat, the governmental institution that stole their deposits, with mud. In Shushtar, victims of Arman Vahdat forced employees out of the building and closed it. Other demonstrators carried signs condemning the actions of the regime and chanted slogans. The uprising, which began in December of last year, continues in the form of widespread protests. The Iranian regime has yet to silence the voices of its people.